Undercutting competition by burning unlimited amounts of investor cash is part of Uber’s business model. Shares of rental-car conglomerate Hertz Global Holdings closed at $14.98 on Friday, after reaching an all-time low of $14.32 on Thursday. These shares have only been around since last June, when Hertz spun off its equipment leasing division. They’ve plunged 73% from their high last July. Hertz will report first quarter earnings on Monday. In the fourth quarter, it lost $440 million or $5.30 a share, much worse than “expected.” Expectations for Q1 are so low that it will be hard to report “worse than expected” numbers. In 2015, it was forced to restate earnings due to accounting “errors” going back to 2011 and announced it was being investigated by the SEC. Hertz, which is junk-rated and has $15 billion in debt, including $9.45 billion in “vehicle debt,” has a tidal wave of bond maturities coming its way that it must figure out how to refinance. Some of its deteriorating metrics have breached debt covenants, and it has been forced to negotiate with its creditors to amend the creditor agreement to avoid technical default. So Hertz has, let’s say, some issues. But there is something else going on, something structural that impacts the entire industry. It’s easy to plow down competition when burning unlimited amounts of investor cash is part of the business model. This allows Uber to undercut any kind of competition. 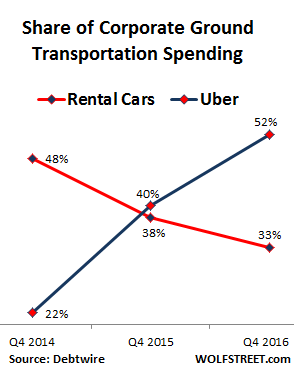 This is largely corroborated by Manheim’s 2017 Used Car Market Report, citing an analysis of business travel expenses by Certify SmartSpend, which pegged the market share of Uber and Lyft in Q3 2016 at 52% of ground transportation spending, up from 46% in Q3 2015. The share of rental cars dropped to 36%, and the share of taxis to 12%. Even if these numbers – like so many numbers – are extrapolated from limited data, and to be taken with a grain of salt, they nevertheless show a terrible trend for rental car companies in that segment of their business. This does not include spending by non-expense-account tourists. They too are shifting from rental cars to rideshare companies to get around in a city. They don’t have to worry about driving and parking in an unknown city. And it could turn out to be cheaper, given the cost of renting, fuel, and parking (not to speak of parking tickets). I see this shift in San Francisco on a massive scale. This is a structural shift. And it will get bigger. Rideshare companies are not only hammering taxi enterprises, they’re also hammering rental car companies in that segment of their business. Rental car companies are starting to respond by “rightsizing” their fleets. In 2015, they bought 1.78 million new vehicles, according to Manheim. That’s about how many they have to unload this year just to maintain their fleet size. If they want to cut their fleet size, they’ll have to unload more. But in 2016, rental car companies bought 1.82 million vehicles – the most since 2007. So the fleet isn’t exactly shrinking. But revenue per vehicle, a key industry metric, has been shrinking since 2012. Hence the term, “over-fleeted.” Something has to give. It isn’t going to be easy for rental car companies to rightsize their fleets without incurring large losses. And by rightsizing their fleets, they will further pressure used vehicle values. At the same time, rideshare companies, which can burn as much cash as they want to and still be heroes, are relentlessly eating into that segment. i wouldn’t do uber on a bet. yellow cabs are horrible enough. but, at least they are regulated. not uber. it has greased every pol that it can to allow it to operate with junkies for drivers. not a user friendly experience. why can’t we have cabbies like they have in london? where the drivers have to know the territory? have to get a license. no, uber is so much like the deregulated commercial airline industry. i quit flying when untied took over the mgt of continental. and i would never do uber. as crazy as using gypsy cabs in london. personally, i am for regulated transport. deregulation is a joke. I agree. Uber and Lyft are going to have to take more responsibility for just who they are sending to pick up passengers. Still the idea has merit and might be tried by public transit agencies. Why hire bus and rail drivers for full time shifts when the bulk of demand is for the morning and evening rush hours. The transit unions would hate it but tax payers and commuters wouldn’t if part time drivers could be hired to meet commute surge demand and the only full time employees would be those who operate the fleet during slack times. They dont seem to be allowed to do it in the US yet. in other economies, transport companies make workers split their shifts ie start at 4.00 am finish a 10 am having not had a brake, and start again a 2.30 or later PM many of them barely making a 40 Hr week but still being tied to the job all day. As they can do very little in the off time between shift parts. It seems in many countries Uber drivers do not need to meet the same basic requirements as taxi drivers, this is unwise. As far as I know SF and Oaktown systems have long employed split-shifters. Not sure if they still must provide 8 hours. Perhaps like airline pilots, the meter could start when they roll away from the gate/yard. Continental mgt. too over United. When is the Uber/Lyft Piper gonna finally demand his due ? Well, I have to say that as a consumer and frequent business traveler, I love Uber. I’ll take Uber over a cab any day of the week. They tend to be much cleaner because they must maintain a minimum customer rating, the drivers are overwhelmingly nicer and more accomodating. While govt. may regulate cabbies for certain aspects of the business – I think the software platform is doing as good or better job maintaining service levels. I think most consumers agree, proven out by the meteoric rise of the adoption rate of ride sharing services. The financial metrics of the business are something else entirely, but from a consumer standpoint, I’ll take Uber. I agree that most of my Uber or Lyft experiences have been better than taxi experiences. Many times the taxi drivers here were driving old, decrepit cars with something falling apart on their car and noises coming from the wheel well every time the tire rotated. They’d get a phone call in the middle of the ride and loudly yell into their phone for 5-10 minutes while driving. Oh, and don’t get me started on the times a taxi couldn’t be bothered to show up for a pre-booked/scheduled ride to the airport and cancelled it without warning. That kind of service is worse than none, since if I knew they were complete flakes I’d have made other arrangements. While I have concerns about the screening process and safety for these companies, almost all the experiences I’ve had were many times better than the decrepit taxi experience I’ve had in most places in the US. I agree that their business model seems unsustainable at current prices and with the current model. That’s why they’re trying to bet on getting rid of the drivers and automating rides or putting everyone else out of business so they can raise prices once the monopoly comes. At some point they’ll have to face reality and investors will tire of dumping their money on a burning fire. On the other hand, they identified and corrected many customer-facing problems the taxi industry couldn’t or wouldn’t (decent cars, attentive drivers, being able to get a ride when needed) and that’s why many people use them and often at a lower price point than their previously terrible taxi experiences. Albert – Not all that long ago, I had to get out of a bad place, and not having a smart phone and all that, I called a cab. Good old Habib came out and got me; we tried to get money to pay him out of an ATM but since I had a credit union debit card it wouldn’t go, but I told him that if he took me to my friend’s house, my friend would pay him. And ol’ Habib drove – nice and fast because it was quite a distance – back to my friend’s house at something like 3AM, of course my friend and his family were up, being night owls, and my friend paid him – by check! And it all ended well. I doubt any Uber driver would have come out where I was, or done that drive. I was going to just walk out the front door and camp out under a bush until daytime, then wend my way home by various buses and things. And then I remembered the existence of cabs. Now, I pay under $20 a month for my flip phone and it’s almost more than I need. If I paid $60 a month for a smart phone plan and downloaded the Uber app, I’m sure I could save money to the tune of an average of say, $5 a month, but paying $40 more a month for my phone …. Yeah Uber’s right up there with gypsy cabs or hitch-hiking. God bless all the Habibs out there driving cabs. Guys, you’re missing the forest for the trees. Yes, Uber/Lytft or other ride-sharing firms are burning money now just to grab market share, but the technological cost-efficiencies and economics are undeniable and revolutionary for the use of ride-sharing/on-demand transport services, EVs, self-driving AI, solar and/or combinations thereof. When AI drives your rental/ride-sharing cars, it will arrive on the dot at 3am, and bring you to your destination in relative efficiency and safety, while you catch up on some sleep. No human drivers need apply. Carmaggedon (private car ownership that is) is at the gates now and will breach the entire market in a few years time, give or take. I’m not normally a positive-oriented character (you-know those who read ZH & WS normally aren’t a positive bunch anyway lol), but the facts and data strongly point to a cleaner future where fossil fuels are largely superseded in all commercial sectors, except for air travel. Pure nonsense. Go read the multi-part series at Naked Capitalism to see that the “technological cost-efficiencies” and “economics” are nonexistent. Uber is charging fares that come nowhere close to matching expenses. They shaft the drivers, who are also stuck with the cost of the vehicles. Yeah, easy to shout objections with 2 syllabus of “Pure hopium” or “Pure Nonsense”…when you got no data to show at all. Jim, you’re still not getting it. The human drivers are just a transitory phase. Whether Uber/Lyft shaft the drivers now or later or never at all is not the point anymore, its over for human drivers once self-driving AI takes over…only a matter of time now. Uber/Lyft or any specific company is also NOT my point here. If Uber fails, others will take its place with the new technology. Just like Nokia, Kodak, DEC and others. Kodak pioneered digital cameras, but it does not mean they will survive it, and very often other companies will pick up where they left off. The point again is to Look at the Forest, not the trees. But its ok if you insist on being Luddites, just stick to your horses and bullock carts. No doubt rentals are being hurt by ridesharing. At some point ridesharing is going to be regulated like taxis, I think. The question is going to be how the regulation of taxis will be changed. Maybe taxis are over-regulated. If some studies get done and the ridesharing companies are shown to be less safe (in various ways) than taxis, they will have a hard time disrupting taxis. Think Theranos. Either you have the business model, including the regulatory compliance, or you don’t. In a few years self-driving cars will make the difference between traditional taxis and rideshare purely academic. By expending their last ounce of energy and public sympathy in fighting an effectively lost war (they may be able to keep Uber out of their country at tremendous cost, but what about self-driving vehicles? ), taxi companies and co-op’s are shooting themselves in the foot. Also municipalities are already sniffing the air with Uber and other rideshare companies. By doing the math they’ll soon learn charging a small yearly licensing fee to a lot of cars beats selling a couple of immensely expensive licenses every few years: munis are always flirting with insolvency and always need money to buy voters. Every scheme that gives them more money, even theoretically so, is more than welcome. Self Driving cars are a dead end . If you haven’t been paying attention the Chaos in Chief put a stop on ALL infrastructure both new maintenance and repair . And that includes the infrastructure needed to make Autonomous even remotely viable . Please stop with the pro/anti Trump propaganda. I am not American and I am sick and tired of it. Well, we will just have to have flying cars. But, the elephants in the room are the car manufacturers. If you think demand has fallen off, just wait until the rental and taxi companies stop buying, not to mention ‘the company car’ will be so so so unnecessary. Nothing ever happens in a vacuum without repercussions. Anyone for shorting the car companies? Taxis over regulated? Uh ya. It is one of the few businesses that can’t be entered without buying the privilege of being in the business, something like the dairy business in Canada, where it isn’t the cows or land that is the most expensive item, it’s the quota, the right to sell milk. There are no more taxi licenses being issued in most places, you have to buy the ‘plate’ in the market. In my little city it’s probably low six figures, in New York the best part of a million. The driver of the taxi is almost never the owner of the privilege. How this tax on the poor keeps going is beyond me. What I hear is that the price of the taxi medallions is plunging. Many of them were acquired with loans by banks that specialize in this. So defaults are hitting those lenders now. And bankruptcies are now occurring. This includes the largest and oldest cab company in San Francisco, Yellow Cab, which filed in January last year. Unlike Uber and Lyft, these companies cannot lose a lot of money for long. One specialty lender is Medallion Financial. The total value of their medallion loans is down ~5% and they reduced the value of collateral (medallions). Its shares, now at $2.20, are down 77% since March 2016 ($9.77) and 88% since Nov 2013 ($17.74). After peaking at over a million in 2015, listings have been as low as 250K. Recent listings range from 310K to 550K. Toronto medallions peaked at 360K a few years ago, now sell for 100K or less. Same story in Montreal based on my chats with taxi drivers there. Most of them are Francophone immigrants (Haiti, Algeria, Morocco, Tunisia…) who invested hundreds of thousands of CAD in their medallions like a mortgage on a house. Now the value has plummeted because of Uber. Plus as others have noted they have to obey a lot of regulations that Uber and its drivers evade. Sometimes, ‘winning’ has nothing to do with happy customers and making a profit. It’s about leaping off a cliff and dragging your rivals with you – knowing that you might survive the fall, and they won’t. Once the competition has been destroyed, the rideshare companies can raise their rates to the moon and make back all the billions it cost them to raze and conquer the market. Their investors are counting on it. They have a strategy. Ah, for the good old days, when destructive, monopolistic, anticompetitive practices were still illegal, and were prosecuted, and markets were orderly and not a nuclear war zone. These days, the corporatist objective is to reign over a horizon of deserted wreckage. Gone are the days when they at least pretended to be good for society. Fled is that music: was it only a dream? Yes, we seem to again be seeing the Pyrrhic victory business strategy of selling at a loss to force out competition, then raising prices to make back the losses. I don’t thing Uber/Lyft can make back their losses, though, absent some government regulatory protections. What is to stop Hertz, Avis, Budget, etc from entering the ride sharing industry. All you need is an app with GPS. Only two lines that make sense here. There is no tech edge since the cost of an app is marginal. Many taxi companies already have (multilingual) apps as good as or better than Uber (Ive seen em with my own two eyes). The competitive advantage is in operating costs and liability – thrashing labor laws with impunity, pushing risk and liability onto that labor and laundering millions in eastern european, asian and south american investment fund cash. The “west” is being hollowed out – a process that is well under way and probably irreversible. Much like the “convergence” trend back in the early 2000s, when giant media conglomerates and Internet companies were swallowing each other whole. Time Warner-AOL being the most egregious example. I was wondering about the top ranges of motors; Rolls, Bentley Porsche etc. What is their story in this bubble? Most of those manufactures are wholly owned subsidiaries of major car manufacturer: Porsche, Lamborghini and Bentley are owned by VAG, Rolls-Royce is owned by BMW, Ferrari and Maserati are controlled by FCA and so on. McLaren may look like a small “niche” luxury manufacturer by in reality is somewhat similar to Kawasaki’s motorcycle division: it’s the small (albeit very profitable) department of a major conglomerate (MTG) whose majority owner is the Bahrain ruling family and which has close ties to Glaxo-Smith-Kline. All luxury car manufacturers have seen their sales shoot in the stratosphere over the past fifteen years, but they are even more subjected to the vagaries of fortune: if you took a walk around Zurich’s Bahnhofstrasse in 2013 you would have seen a field of McLaren’s and other ultra-exotica with staggering price tags. These days you just see the occasional Tesla: as expensive as it is, it’s dirt cheap compared to what came before. After 40 years of the profits of increased productivity being funneled almost completely to the top 1% and more so the top .1%, there’s lots of money sloshing around to buy baubles. Why is this a surprise? Maybe they’ll enter the as needed market. It’s already happening with BMW. I see ReachNow BMW 328i and 330i models all the time in my neighborhood in Seattle, and I’m just dumbstruck how that kind of business model could be even remotely profitable. The cars are like $40k new, figure in mileage, depreciation, and wear-and-tear from parallel parking/rental drivers…if Uber isn’t profitable, there’s just no possible way ReachNow can be. I see your point but the manufacturer like BMW the car probably only cost $25k. They have an advantage over Uber in that aspect. And while the sticker of a Bimmer, or Benz may seem not too bad, you really don’t want to repair one. This is why the used ones can seem almost cheap. Pop Mechanics in their auto reviews, used to quote the price of a few routine parts; an alternator for a BMW was over a grand 20 years ago. Old Euro cars are fine. 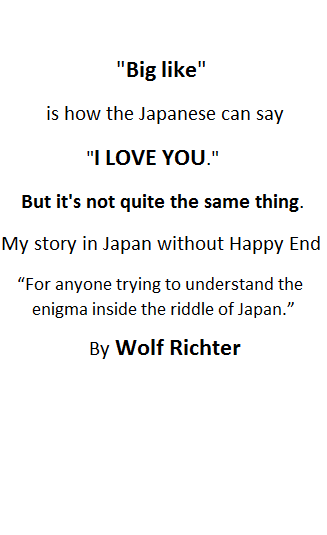 IF you can do the work yourself, otherwise japanese is the only way to go today. Yep. Barriers to entry on Rideshare are VERY low. The Uber model is doomed before it really gets started. Their cash burn rate is completely un-rectifiable. The larger they try to get, the more cash they burn. What will more likely happen is very small firms will get into the business, and it’ll morph into a very fractured market if any market at all. When a CEO of a screwed up business model, says he needs driverless cars to make the model work, when driver-less cars are so far beyond the possibility of being real on any meaningful level other than just high cost experiments, you know that business model is totally broken before it even gets started. Also, only the ignorant actually believe fossil fuels will go away within the next century, because they totally don’t understand our power grid, the cost of making electricity, or the real hidden losses in the power system that make electric cars more of a figment of Musk’s imagination, than solar power is. Solar for example, has been kicking around since the 70’s. And despite all of the costs dropped out of it, its still only less than 1% of all US power production, and even less of a percent world wide. Where it does exist, it cannot be viable and is not cost viable, without the back up of grid tied solar where the grid is fossil based. Everyone is chasing a fools paradise on solar power, and the same thing will be said 40 years from now on electric vehicles, when people realize even after tons of costs are dropped in the vehicle (i.e. battery) it will still only be able to garner a small fraction of the transportation market. Its too bad people don’t understand the physics of batteries, (their horrible inefficiency even in the best of circumstances), and that their only blessing is in very small portable devices, that aren’t massive like cars, or consumption gads of power that the motors need to move 2 tons. Tesla is losing more than $30,000 per copy on a car that sells for $100,000. When they try to sell a car at $35,000, they will then lose $100,000 per copy. ITS JUST NOT VIABLE, and no gigafactory is EVER going to address the massive inherent flaws of a hugely inefficient device called a battery, and this thing called a power grid which can barely handle current demand of all electronics, let alone battery cars if they ever get added in enough quantities beyond the tiny fraction of a percent they represent today. A much better and far more efficient technology, is the fuel cell, which while today seems rather distant, does not suffer the fatal flaws of batteries and where electricity attempted to be used as an a faux energy ‘source’ rather than the carrier of energy that electricity is actually is, and always will be. Knowing the difference between an energy carrier and an actual energy source, and the ramifications of the physics of that, is why electric cars will never become widely prevalent, and at best will be a short lived bridge to fuel cell driven vehicals, operating also on fossil fuel, but mostly emission less. In any event, Uber is beyond Uber stupid. Guardian had a source saying if just a few electrics plug in at the same time, a local brown out may occur on the block. The cost of a ride would go down, the drivers would make more. It’s very important not to confuse this medallion requirement with any kind of safety issue. There are numerous businesses with FAR more demanding safety regs and personnel screening than cab cos: e.g., small private airlines, ferries etc. where there are costs to enter the business but not six figures for the privilege of entering the business. In my city, unlike New York, most taxi users are limited income. The cost/ financing of this bizarre, close to unique aberration in the market comes out of their hides. And then there is Enterprise. Hertz is a tired publicly owned pioneer, eclipsed by a leaner and privately held operation with incentives for effective management. Hertz, shilled by OJ Simpson. Enterprise, the NHL supporter. :-) (Canadian here…Our Game). Seriously, I have a nephew who works for Enterprise, (started a career with them after earning an accounting degree), and he has been very happy working for them. He has some kind of management role in the Bay Area. I’m still waiting for a few Uber lawsuits, plus, isn’t Uber setting the pace for losing money? And then Hertz will be a strong buy. Uber was created by the taxi business and their unwillingness to service the areas they are supposed to cover. As a New Yorker, I was forced to use gypsy cabs if I needed a taxi in the outer boroughs. Yellow cabs didn’t and wouldn’t take you from Manhattan to the Bronx or Brooklyn. They only cover Manhattan and the airport routes. When the taxi business complains, I have no sympathy for them and neither do the countless other riders who got ignored in the past. My company signed up with Uber’s corporate initiative. Uber is now my companies preferred taxi outfit. They have updated the app to keep personal and business trips separate now. Hertz is an over-indebted, PE-owned flame-out waiting to happen. And Uber is in much worse shape. I’ve had my share of aggressive Taxi drivers, as well as difficult to get in suburban areas so wait times are long. Although Uber is not as well regulated I would prefer them over Taxi services anyday. They may not survive in the long run, but it will never go back to just Taxi services. At least until automated driving makes insurance for human drivers cost inhibited. Rental car companies are losing proposition so cheaper and more convenient services become available. With automated cars, will just accelerate that trend as there will be no limit to the destination. Egypt is one of Uber’s key markets. They have over 40,000 drivers in the country, over 30,000 of them in Cairo – 2000 new drivers sign up per week. That’s explosive growth. 40% of Uber drivers in Egypt were previously unemployed – so no matter what they’re charging, it’s providing a wage to those who previously made nothing. As for business sustainability, as an end user, this doesn’t bother me. Uber has local and regional competitors, it’s hardly a monopoly. Let the dice go where they may – but I use Uber Select on a daily basis, nice new sedans with AC and tinted windows – drivers utilize GPS mapping on their mobile phones – it’s an altogether civilized way of making one’s way around a megacity of 20 million. Hertz’s pain can be your gain. Hertz was running a special to unload excess cars in San Francisco. For my daughter I bought a one-year-old Mazda 3i, 29,000 miles on the odometer, with about a 40% discount compared to buying a new one. Unbeatable deal. This is how fleet sales end up killing new car sales. “It’s easy to undercut competition when burning unlimited amounts of investor cash is part of the business model.”. Well Wolf, what else is new. This is Netflix, Amazon, FB,and hundreds of other companies, No profits, just expenses. And, just how can the never ending river of funds be flowing into these companies….just ask the central banks. This is not so much ‘investor cash’ as it is a back door nationalization of companies with unlimited printing of fiat by the company of all companies, the central banks. Make no mistake, they are ALL doing it, charter be damned. This is what the ‘Mafia’ does to competitors. …. no more broken legs, just broken companies the easy way. BS, Netflix, Amazon and FB are profitable. Did they benefit from CB largesse? Obviously, but so did other non Internet companies. Uber and Lyft are different because there’s no economies of scale from the start. Right, “profitable”. Perhaps 300 years from now they even start paying dividends. Something strange is happening NOW and Uber vs Hertz may not be the issue. I’ve been renting cars from a local Avis for years. It was always hard to get a good car there. For the last month the large lot is full of cars. I’m told nobody is renting. Nobody’s buying stuff at the stores and whole sections of local downtowns in several areas around me ‘for rent’. My haircut place was empty- again, customers are down. I’m told business is bad (at a cheap place no less). Have people stopped getting haircuts? Early Riser – by “cheap” do you mean a $20 cut? Or a sub-$10 cut? One of the benefits of having a large “internal third world” here in the much-vaunted “Silicon Valley” is, you can get a pretty decent cut for under $10. My place is between a pinata shop and a storefront church, and it’s easy to miss unless you know to look for the pupuseria that’s the next building. It’s right on the bus route. A cut is $8 or $9, and I tip a couple of bucks. When places like that are shutting down, you know we’re really in trouble. But supercuts/stupidcuts and the places that want $40 or more for a cut, those might be in trouble. There have been those Wahl clipper sets in stores for decades now. They’re not a secret. it helps that the “buzz” is in style now. There are probably lots of people who’ve learned how to do a passable cut with those and they do cuts for their family and friends. But spending in general, I agree, has to be way down. People are buying basics, not frills, not the anyone in the bottom 4 quintiles. Maybe a good measuring-point is things like bicycle sales, and public transit use. I know public transit use is up in my area, and I don’t know about bicycle sales but I have a feeling that’s probably up too. One thing as I’ve mentioned before, is that as more and more of the population is an “independent contractor” or 1099 worker, well, they don’t get their taxes auto-deducted and “do their taxes” and get money back like a regular employee. Instead, they hopefully save up enough, write a big check, and tighten their belts for the next month or two. In past times, the W-2 employees far, far outnumbered the 1099 independent contractors so at this time of the year, spending if anything went up. But if 1099’s are becoming a bigger part of the work force, you’ll see this – a slump in April and May, maybe even into June. Here in Austin they kicked Uber and Lyft out and we had multiple competitors in days who all offer equivalent service. I use Ride Austin which is non profit and gives 100% of the fare to driver’s and keeps a $1 booking fee to fund operations. I use Enterprise on the weekend for the $9.99 special. They can’t be making money. I never understood the hysteria about Uber. Any taxi company can hire a programmer to write them an app and compete with Uber. I know that the real reason is the taxi companies have already “invested” in the public officials and they expect the return to be no competition ever. Don’t you love free markets. This ignorance-based trope emerges in every discussion of Uber. Passengers and drivers see the UI that is supported by a massively complex back-end infrastructure. Uber employs thousands of engineers, data scientists, managers, analysts, etc. to operate the company. No taxi company can do this. A local taxi company may own at most a few hundred cars and they are confined to a service area. This is an easy app to write and the back end can be put on the cloud for as little as $50 a month. All you need is billing info and pickup/dropoff info, not a big deal. A buddy of mine is an aging taxi driver. His company has an app like that. It’s just that customers don’t seem to use it very often (he doesn’t get a lot of rides from it). Once people have their smartphones out, they use rideshare apps. This is called marketing, and taxi companies have lost that battle. Isn’t part of the taxi medallion thing to keep the streets passable? In SF and Berkeley those cars with the “backward C” and the pink mustache are clogging the streets royally. An acquaintance who “drove uber” for a short while told me of all the Cal students using uber to cover short distances. He gave up on it, it took him way to long to complete a $5 ride. The Times bidness section had an article recently about Kalanick’s minions in India, trying to gain a stronghold before people can get into the car buying mentality. 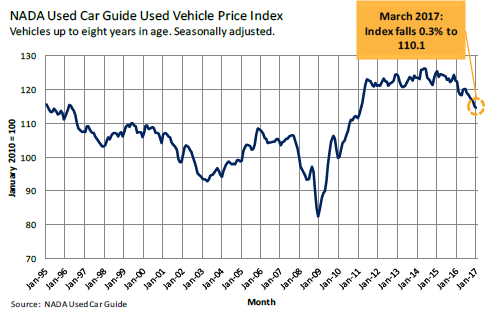 Declining depreciation schedules Can’t help the likes of Car2Go and Reach? In Singapore there are already 2x more Uber/Lyft cars than traditional taxis…Many taxi drivers have dumped their rentals with their taxi companies and jumped ship to Uber/Lyft, because why pay ~USD$80 per day to rent a taxi from the taxi company when they can pay for their own private car at the same rate with a lot more flexibility, which makes more sense even in the world’s #1 most expensive car market.